Dante’s Purgatory is the anchor of the Divine Comedy: less well-known than Inferno, but still more rooted in the human condition than Paradiso. It’s a story of restoration and the place where saved souls are prepared for heaven. Regardless of your doctrinal views, Purgatory is the meat of the Divine Comedy, and some of Dante’s finest work. His masterful understanding of human nature causes the saved souls of Purgatory to jump off the page as relatable human beings, even hundreds of years later. On a story level, Purgatory follows Inferno. Dante and his guide, Virgil, have already traversed the nine rings of hell and have now ascended into purgatory, the land where saved souls are purged of sin in preparation for ascending to heaven (which Dante will visit in book three, Paradiso). Dante has been granted the journey in order that seeing these realms might save his soul from destruction. Hell’s grand and terrifying rings revolved around motion, culminating in a motionless, frozen Devil in the center of the world. As motion is to hell, so love is to Purgatory. Purgatory is devoted to correcting human misuse of love, and filling dead souls with true love in order to make them righteous and able to ascend to Heaven. All sin, according to Dante, comes from love — whether a misuse of love, a deficiency of love, or love for good things, but out of its proper order. The souls we find in Purgatory are not like those of Inferno. While those souls are relatable, their certain condemnation works more as a warning than anything else. Purgatory, however, exists to prepare souls for heaven, and so the overarching tone of this book is hopeful, offering hope and encouragement to Dante, who has life to live yet. The souls of the violent are an excellent example: while they are still human and express the violence found within the human heart, they have the hindsight and wisdom of dead Christians to condemn their sin. Dante is a master of providing this hindsight without having actually been a dead Christian himself, and the result are characters that resonate with real human experiences. The poetry and excellence in Dante’s writing is commendable, and worth a reading for nothing more than the beauty of the language. Anthony Esolen has done a phenomenal job of translating the text so that it sings, and his marginal notes and footnotes shed great light on the text. Esolen’s comments on each canto, found in the back of the book, are especially helpful for advanced readers, and draw out thematic elements throughout the entire book. This edition offers a very accessible version of Dante’s poetry without compromising the beauty and excellence of the original. 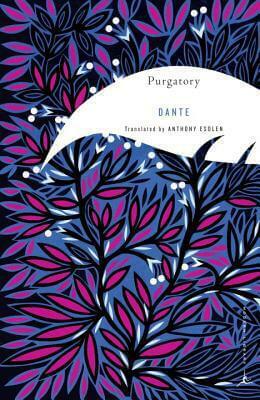 In short, Dante’s Purgatory may be less commonly read than Inferno, but it’s well worth the time, especially in Anthony Esolen’s translation, back to back with the other books in the Divine Comedy. I recommend reading in fairly large chunks of three to five cantos at a time, which is enough speed to keep the overall flow of the book, but slow enough to understand the language and meaning in Dante’s writing. Purgatory is definitely a book with more meaning than can be found in one reading; and like any good classic, promises many to reveal many secrets in the years to come.